Well this isn’t about what you might immediately presume it’s about, no this isn’t a post all about weight loss. In fact it’s pretty much the opposite, it’s all about pork belly! 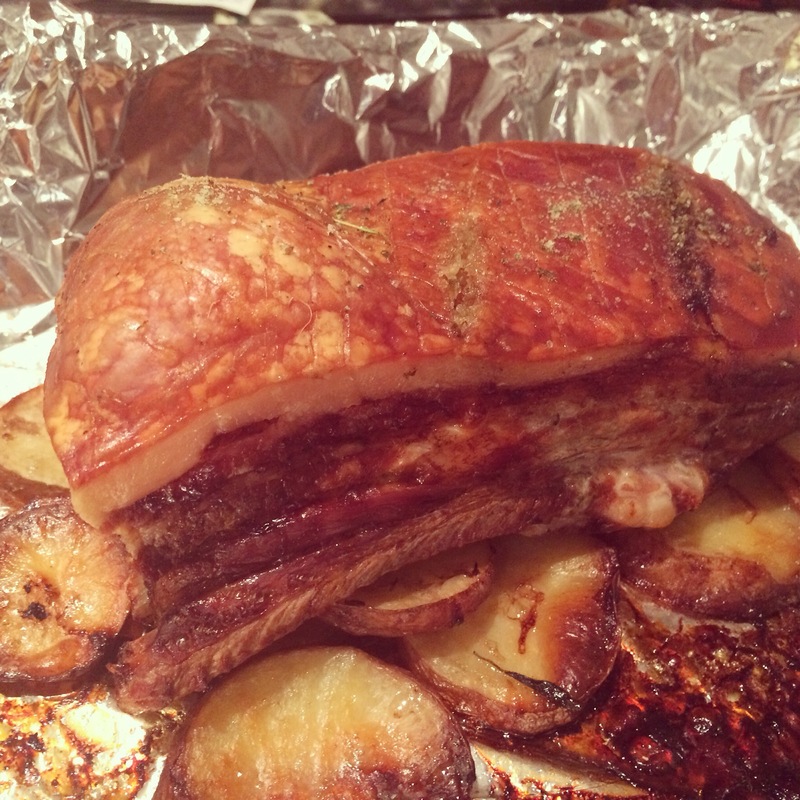 This inexpensive cut of meat has frustrated me as a home cook for years, how to to get the crackling just so, how hot should the oven be…..to cover or not to cover it….too many bloody questions quite frankly. Actually I say I based it on it…..to be fair I followed it pretty much to the letter with the exception of some extra veg I will get onto. To start the pork belly process I scored diamonds across the fat using a sharp knife. Then poured a pint of boiling water over the top, to be honest I’ve no idea why you do this but pretty much every recipe tells you to so roll with it. From here you pad the fat dry using kitchen towels, really press down to make sure you get as much moisture out as possible. With a mortar I crushed some maldon salt with fresh time and peppercorns to get a fine consistency. The key seems to be to use way more salt that you think is reasonable, I guess with all the fat it can take it. I found that as I added the salt more moisture was drawn down so padded it down again and then added a little more salt. Onto then boulangére potatoes, apologies if I’ve spelt that wrong, anyone who has ever had a text conversation with me ever or read my blog more than once knows I can’t spell. ANWYAY…potatoes, yes, so start off by peeling them. Then In a pan sauté 2 large sliced onions and thyme, I added garlic but this was my own touch, until the onions are soft and translucent. 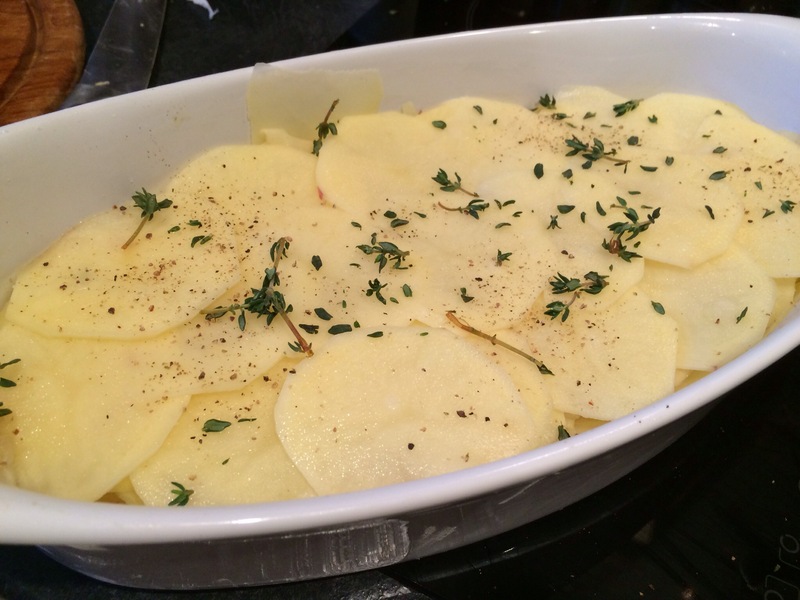 With a mandolin, if you own one, slice the potatoes as thinly as you can as you would for dauphinoise. Then in a dish layer the potatoes to cover the bottom, then add a layer of onions and repeat as appropriate. Then add approximately a pint of good chicken stock so just the very top potatoes aren’t covered. Unless you plan to let to pork belly sit open over the potatoes add some butter or if you have duck fat on top. Get your oven on an up to 170 degrees Celsius, many recipes vary on this point with many suggesting 200 or even 210 but I decided this time I was going low. Cooking time, well the belly weight 1.5kg so with the low temperature I went for just over 3 hours. Placing the pork on the middle chef I put the potatoes on the bottom and left it alone. Next, the old favourite apple sauce. 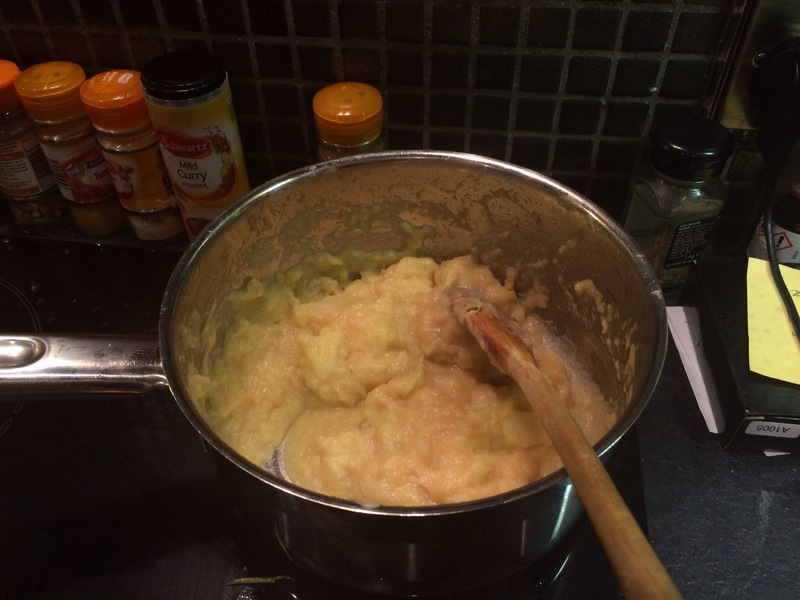 Simples….so 3 x bramley apples peeled, cored and diced, 25 gms of butter and the same of sugar, pinch of cinnamon & salt and some lemon juice. Started out with melting the butter, as it foamed added the sugar and let it dissolve in the pan. In with the apples and covered with some foil to let it start to break down. After 5 minutes or so in with the other ingredients and continue to cook over a low heat. Job done. Next up, vegetables to go with this feast. I fancied honeyed parsnips and carrots but it’s something I pretty much always get somehow just a bit wrong or certainly not as good as I felt it could have been. Well ladies and gentleman I’ve cracked it, yes after many carrots and parsnips I’m happy to say I got them to a point where even I was happy. I always par boiled and then then roasted drizzling on honey before they went in the oven. 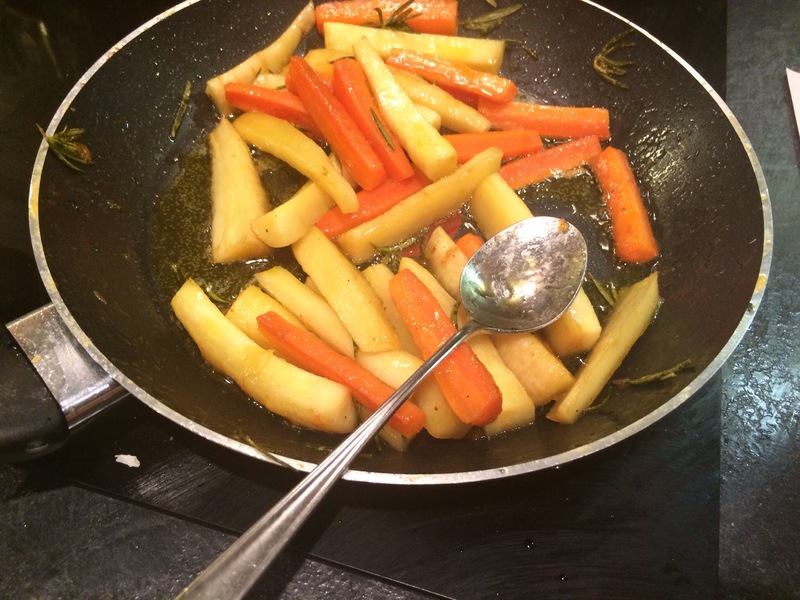 Well this day I tried something different, same batons but this time i just sautéed them, plenty of butter, rosemary and then honey all in early over a low heat in with the veg and I basted them in the pan! Tremendous if I do say so myself. Many hours and a few glasses of red wine by, we watched at the fat on the pork puffed up and started to crisp, stock in the potatoes bubbled and I crossed my fingers. After 200 minutes……I finally removed the pork and hoped for the best, the result? Well actually it was pretty damn good. The crackling was light and crunchy, the fat well rendered down in the meat leaving lots of oozing tender goodness. 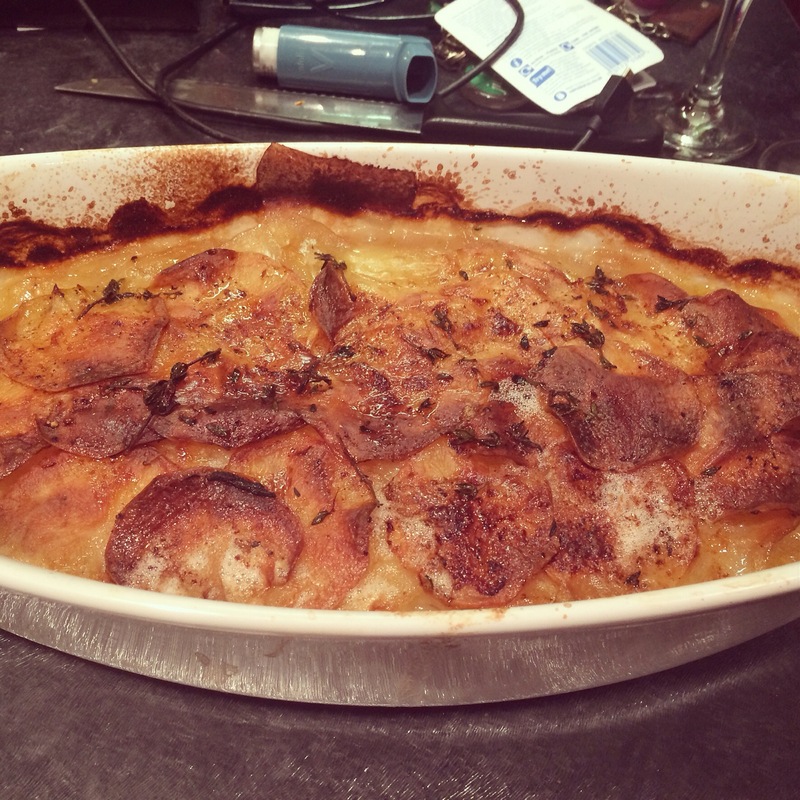 The boulangére potatoes which were new to me had the garlic goodness without the cream in dauphinoise allowing it to cut through the fatty pork and along side some apple suace and honey veg it made for a very tasty last supper. 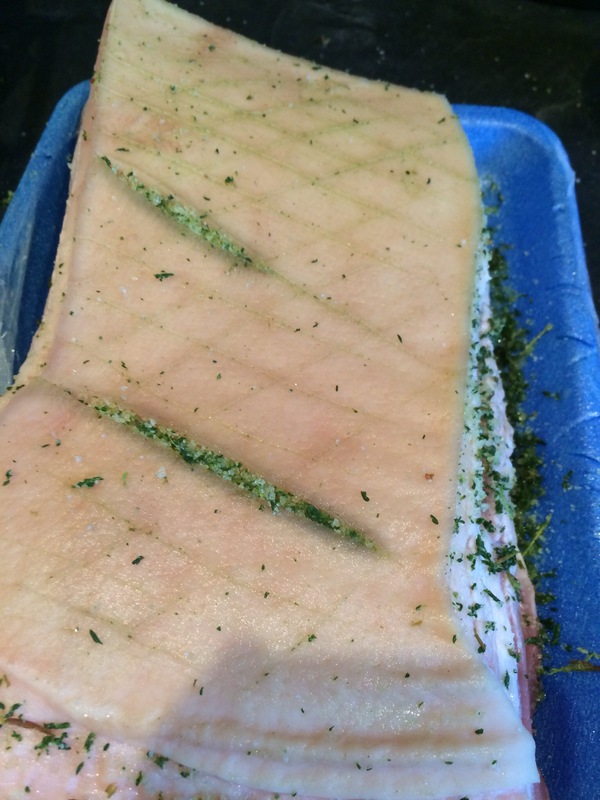 Lessons I learned…..low and slow is best….more salt the better…..no need to cover the pork. Pan roasting veg is tasty. All in all a meal that I would modestly say comes highly JD Recommended.